The polyester single door compact wall mounted enclosure range, UCP/UCPT, with a IP 66 protection degree, is available off the shelf in many different sizes. Either a plain door or transparent door can be ordered. This enclosure range is well suited for outdoor installations, even when exposed to direct sunlight. The risk for component failure, and with that unnecessary downtime, is eliminated as water and dust are prevented from entering the enclosure. Fibre-glass reinforced polyester. UCPT viewing area: polycarbonate. Monoblock moulded 3 mm thick. Four holes for direct wall fixing. Without gland plate openings. Door, with or without window and 180° opening. For UCP/UCPT750 and above, a door support is supplied for easier closing. Sealing is by an injected one piece polyurethane gasket. Double-bit 3 mm insert and 90° movement. UCP/UCPT540 and above have three locking points. Other locks are available as an accessory. IP 66 | TYPE 4, 4X, 12, 13 and IP 65 only for UCPT430. Impact resistance IK 08 (IK 07 for enclosures with transparent door). CE, GOST. 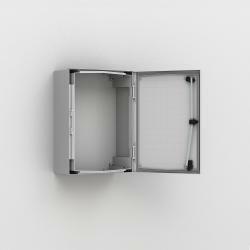 CSA and cULus_UL Listed approvals apply to plain door enclosures only. For further approvals, please contact Eldon's sales department. Enclosure with door, fixing screws for the mounting plate and a self adhesive rain strip. UCP320, UCP430 and UCP540 are delivered with the doors inside the packaging, unmounted.